During GlobalHack VI in St. Louis, Missouri S&T student teams won $100,000 and $50,000 for designing ways to help the homeless. Being civic-minded comes with rewards, both emotionally and — for Missouri University of Science and Technology students — financially. Missouri S&T computer science and computer engineering students competed in GlobalHack 2016 in October in St. Louis, designing software to provide help to the homeless. The team ScoobyDoIt, with S&T juniors in computer science John Bagsby and Seth Kitchen, won the college division and a $100,000 prize. Also on the ScoobyDoIt team were Jacob Baird from Southern Illinois University-Edwardsville and Tom Hood of Westminster College. The challenge was to use software called HMIS, or Homeless Management Information System, which collects and analyzes data for homeless clients or those at-risk of becoming homeless. 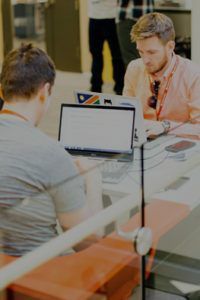 Teams were asked to develop solutions for one of four sub-problems, which were generated by in-person interviews and focus groups conducted by GlobalHack staff and partners. Topics included prevention; emergency shelters; electronic referrals and data sharing; and data visualization. Bagsby is a junior in computer science from O’Fallon, Missouri, and Kitchen is a senior in computer engineering from O’Fallon, Missouri. The team designed a phone messaging kiosk and web application that helps people find food pantries and homeless shelters, and it’s fully functional and implemented, Bagsby says. Just as important, the design also works on cellphones. “We came up with the idea because it was made known to us that around 40 percent of the homeless actually have smartphones,” Bagsby says. “But to reach out to more, we decided to use Twilio, which is a text message and phone service library that allows people without a smartphone to text or call in to get information about the nearest shelter or food pantry. With Twilio, the application accesses the user’s ZIP code, and with that information a Google program plots the nearest food pantry or shelter and sends that information to the user. The final part of the project was a universal Windows app that they’re putting on kiosks that are placed in areas of high homelessness. ScoobyDoIt wasn’t the only S&T team to do well at the GlobalHack. Missouri S&T freshmen Matt Sauer, Samuel Wait and Greg Cordover’s Penguin Team was second in the college division and collected a $50,000 prize. Penguin allows the homeless to call into a central system that will tell people what shelters are near them and which have open beds. Sauer is a freshman in computer science from Chesterfield, Missouri. Wait is a freshman in computer science from Town And Country, Missouri. Cordover is a freshman in computer science from Chesterfield, Missouri. GlobalHack drew 156 teams from 33 states and seven foreign countries.